1) Orientation - Take a map and/or guide book with you. National Geographic's Trails Illustrated Maps are excellent. Use the map to keep track of your progress so that you know where you’re at all times. It’s also a good idea to carry a compass, and know how to use it as well. Earlier in the summer the NPS announced the launch of two new National Park Service Junior Ranger WebRanger games to learn about rip currents and general water safety. I'm bringing this to your attention because water is the number one cause of fatalities in Glacier National Park. The online WebRanger games are a great way to introduce children to the dangers water can present, and what they can do to help prevent accidents. The games can be found at http://www.nps.gov/webrangers. The Logan Pass area in Glacier National Park is well known for spectacular displays of summer wildflowers. This area is home to popular flowers like glacier lilies, beargrass, spring beauties, paintbrush and wandering daisies; but the area also harbors an exceptional number of rare arctic-alpine plants. There are more than 30 different rare plants and mosses in an area that covers less than three percent of the park. As a result of the unique assemblage of sensitive species found in this small region, the Montana Native Plant Society designated the Logan Pass area last April as the first Important Plant Area (IPA) in the state of Montana. An IPA is a special designation modeled after Important Bird Areas identified by the Audubon Society, a global program to identify and conserve areas that are vital to birds and biodiversity. Jack Potter, Glacier’s Chief of Science and Resources Management, says "While these areas are not legal site designations, the IPA’s are a great tool for identifying and highlighting locations in which to focus conservation actions, research, and funding for plants and habitats." Potter also reminds park visitors that "this IPA, as with all high elevation areas in Glacier, is very sensitive to trampling and human disturbance. Sections of the Logan Pass area are even subject to seasonal closures when the soil is saturated from snowmelt. We ask visitors to follow the ‘leave no trace’ principles and stay on the trails which are the best place to view these spectacular wildflowers." The Logan Pass IPA straddles the Continental Divide. It is located at the headwaters of the St. Mary drainage and ranges in elevation from 5,100 feet along Reynolds Creek north of Heavy Runner Mountain to 10,000 feet on Mount Siyeh. The Logan Pass region is a particular hot spot due to a wide diversity of habitats, including alpine meadows, wetlands, turf, hanging gardens, fellfields, moist and dry dwarf shrublands and more. Within the new IPA you can find eight globally rare species and 27 different state listed sensitive species representing about 30 percent of the state-listed species found in the park. 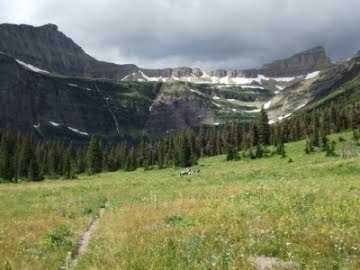 Logan Pass provides habitat for the world’s largest population of goose-grass sedge. It the only place in Montana to view glaucous gentian, running pine, Macoun’s draba, and several moss species. Deep in the wilderness it's highly unlikely you'll be able to get updated local weather forecasts. Essentially, you have to become your own forecaster. Backpacker Magazine has a very helpful article on their website that explains how to identify the various cloud formations and what they mean. They even have a quiz to help you further understood what you just read. As far as keeping up with updated forecasts before heading into Glacier's backcountry, as well as finding historical climate information, please click here. 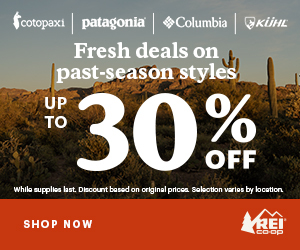 Personally, if I’m climbing a lot of elevation - say up to Piegan Pass as an example - I’ll mostly rely on Gatorade, Power Bars and trail mix that includes dried fruits, pretzels, nuts and M&Ms. These foods provide a lot of simple sugars and carbohydrates which offer quick release energy as I proceed up the mountain. Once on top, I’ll usually have a sandwich or peanut butter crackers. These foods tend to include more protein and fat which provide slow burning fuel for the trip back downhill. If you’re properly fueled for the trek up the mountain, your energy needs will be less going downhill. This will definitely keep you awake in your tent at night! Earlier in the summer, Glacier National Park announced that it will be participating in a long-term interagency program to monitor the trend of the grizzly bear population in the Northern Continental Divide Ecosystem. Bait stations, automated cameras, and traps will be used to capture and monitor grizzly bears within the park. The program attempts to maintain a sample of up to 10 radio-marked female grizzly bears out of an estimated population of 300 grizzly bears living in the park. Bait stations and trap sites will be marked with brightly colored warning and closure signs. For safety reasons visitors are reminded to heed and comply with these signs and not enter areas closed for baiting or trapping. A man died last year seven miles east of Yellowstone National Park after he wandered into a capture site and was attacked by a grizzly bear. Trapping efforts will continue at various locations throughout Glacier National Park beginning June through October. For further information, please contact park bear biologist, John Waller, at (406) 888-7829. Actually, you can avoid that feeling by doing a little training beforehand. Although what’s considered to be a long hike for any individual is purely relative, we’ll use the 9.7-mile roundtrip hike to Iceberg Lake as our example of a long distance hike for purposes of this article. The best way to train for any sporting event is to train specifically for that event. In other words, if you want to hike a long distance trail, it’s best to get out on a trail to simulate the conditions of your big day. However, for many people, finding a trail to train on may not be convenient. Walking in your local neighborhood or in a park is an excellent alternative. I’ve trained for a handful of hikes up 14K foot peaks in Colorado by walking in my own neighborhood. With peaks slightly higher than your average ant hill in my adopted hometown, I obviously wasn’t able to simulate the type of climbing I experienced in Colorado, but I was still able to sufficiently train my walking muscles. 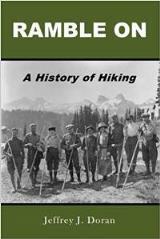 Using the example of preparing for the 9.4-mile hike up to Iceberg Lake, you should probably start training roughly 4 weeks before the actual hike. This assumes you already have a minimal amount of conditioning. Obviously if you have no conditioning, or a lot, then this schedule would need to be altered accordingly. During the first two weeks of training you could probably get away with walking just three days a week. During the first week, two of those walks should be at least 2-3 miles long, and the third walk should be in the 4 to 5 mile range. During the second week, you should ratchet up your long walk day to around 5 or 6 miles. The other two days should consist of walks of at least 3 miles per day. If you’re going to be climbing any significant elevation on your hike, you should try to include as many hills into your routine as possible. The Iceberg Lake Trail climbs roughly 1200 feet. For many people, this can be a strenuous hike. During week 3, you’ll probably want to add a fourth day of walking into your schedule. 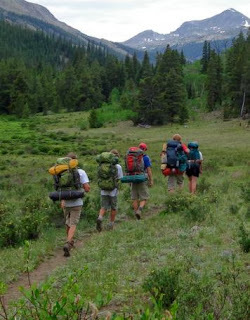 Your long walk day, which preferably should be 7 days from your big hike, should now be in the 7 to 8 mile range. 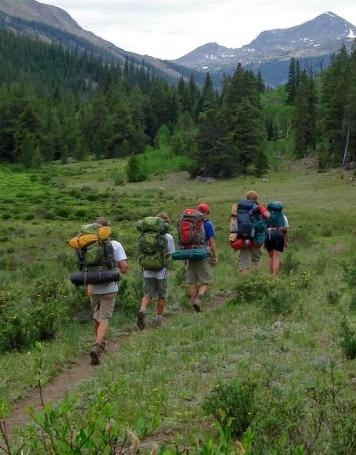 During the final week before your hike, you should still be walking on at least 2 or 3 days. Each of those walks should be in the 4 to 5 mile range. 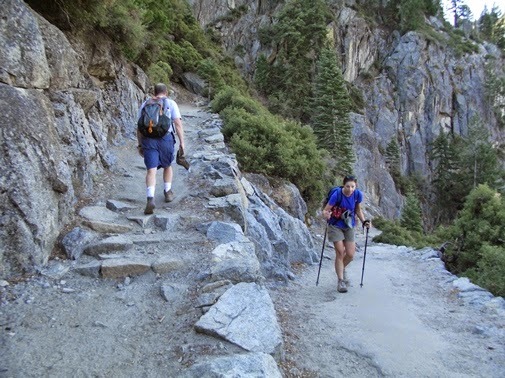 If you’re already on vacation, use the days leading up to your big hike to train on some shorter trails. Make sure you’re well rested though. At a minimum, the day before your hike should be a rest day, meaning, no training on that day. You might even consider taking two days off prior to your hike. This way, your leg muscles will be well rested and you’ll be ready to conquer your goal. On the day of your hike, make sure you take enough food and water with you to keep your fuel and hydration levels up. See my posting about staying properly hydrated and beating the heat while hiking in the summer. A little preparation beforehand will go a long way on the day of your big hike. Your training will give you the confidence to persevere, and you’ll feel much better when you arrive back at the trailhead. You may even have a little energy left in the reserve tank to celebrate your accomplishment after you return. From the Glacier National Park website. • To preserve and protect the natural and cultural resources for future generations. • To celebrate the ongoing peace, friendship, and goodwill among nations, recognizing the need for cooperation in a world of shared resources. • Glacier’s scenery dramatically illustrates an exceptionally long geologic history and the many geological processes associated with mountain building and glaciation. 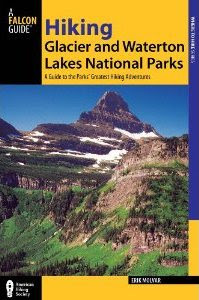 • Glacier offers relatively accessible spectacular scenery and increasingly rare primitive wilderness experiences. • Glacier is at the core of the “Crown of the Continent” ecosystem, one of the most ecologically intact areas remaining in the temperate regions of the world. • Glacier’s cultural resources chronicle the history of human activities and show that people have long place high value on the area’s natural features. Lightning can be one of the most frightening hazards that hikers encounter during the summer months. With warmer weather comes an increased chance of running into a thunderstorm while out on the trail, especially during the afternoons. Hikers need to be watchful for storms that produce lightning, particularly in open areas where you may be the highest object in the immediate area. According to the National Weather Service there are, on average, roughly 20 million lightning strikes that result in 273 injuries and 48 deaths in the U.S. each year. Those casualty figures may seem fairly low. Indeed, National Geographic estimates the odds of being struck by lightning at only 1 in 700,000 in any given year. However, over the course of a lifetime, your odds of being struck jump to 1 in 3000! Hikers at the higher elevations in Glacier should be especially conscious about the dangers of lightning. 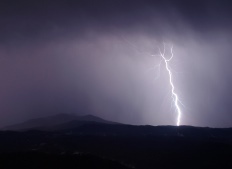 According to the National Outdoor Leadership School, lightning density maps show lightning strikes occurring more often at higher elevations in the Rocky Mountains, where the air and climate is drier. Summer hiking season is already upon us. Anyone who has ever been to Glacier National Park during the summer knows how hot it can get in the Northern Rockies. I’d like to offer some tips for beating the heat during the summer months. Before we dive into anything else, I would like to emphasize that the most important thing about hiking during the summer is staying properly hydrated. Hiking in hot, dry weather depletes your body of liquids. To replace lost fluids and electrolytes you need to drink frequently. If you wait until you feel thirsty, you’ll more than likely already be dehydrated. The more dehydrated you become, the less efficient your body is at cooling itself down, thus making your body become less efficient at walking. When it's really hot, my wife and I will fill a couple of water bottles about half-way and stick them in the freezer the night before. Then, just before leaving for our hike the next day, we'll top-off the bottles with cold water. This way we'll have cool water to drink for a much longer time on the trail. Please note that you don't want to put a full bottle of water in the freezer as it will crack the plastic. Summer also provides a great opportunity to explore trails at the higher elevations in the park where it’s naturally cooler. Keep in mind, however, that the summer season can bring thunderstorms to Glacier. Never ascend above tree line when there’s lightning in the vicinity. If you’re already above tree line when a thunderstorm approaches you’ll want to descend immediately. Two Medicine and Many Glacier will close on Monday, September 19th. Logging Creek will close the following week on September 26th.